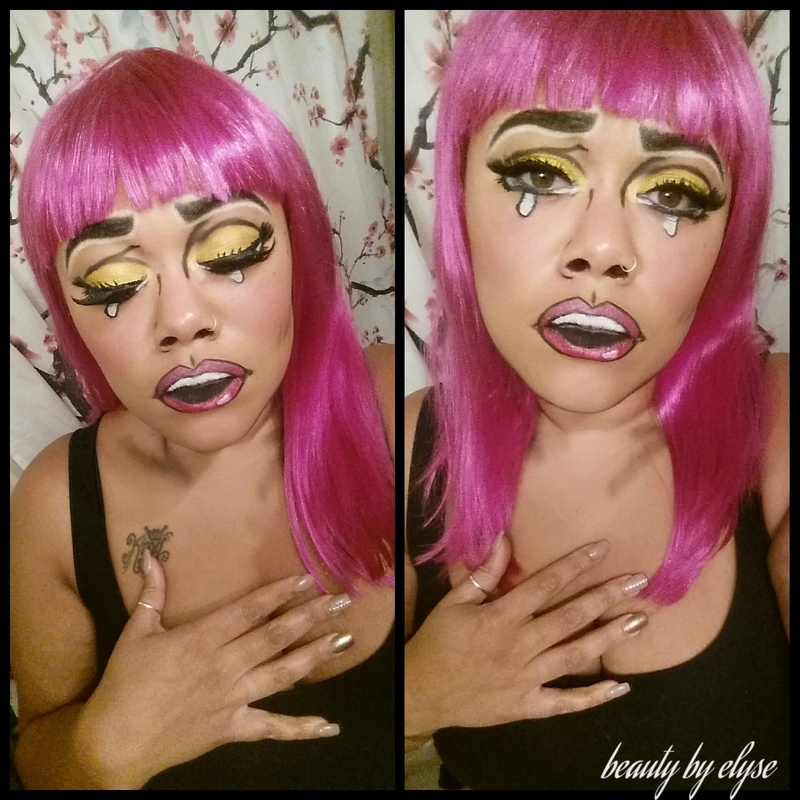 Foundation: I used my Studio fix by M.A.C. I am really starting to like this product again, it gives my face such a smooth even finish. To outline my face and neck I used black eye shadow from my Morphe palette. Blush: BH cosmetics Professional blush palette, I used a rosy pink color (sorry, there was no name for it). Brows, nose and eye outline– I used NYC black eyeliner pencil. Now I would not recommend this if you plan on doing this look or something similar for Halloween. I say this because this pencil does not stay put. I had to fix my eyebrow three times because any little touch smudges or removes the liner. I only used it because I wanted to be able to easily remove my makeup after I took these pictures. I would recommend a waterproof/smudge proof liquid liner for this look like Wet-N-Wild H20 because as I stated many times before it does NOT come off lol. I used NYC white eyeliner to outline my brows. Eyes: I used ColourPop cosmetics “sunrise” eye shadow, Wet-N-Wild H20 liquid liner to draw in fake eyelashes (before applying real ones) and to draw my wing. 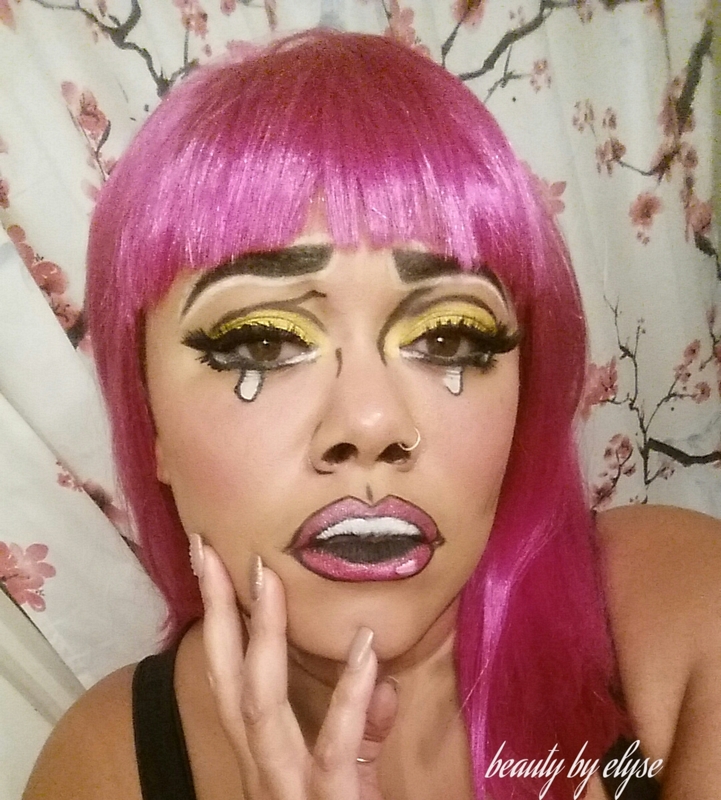 I used NYX ‘milk” jumbo liner pencil to fill in my tears, tear ducts, and outer corner of my eye. Lips: I filled in the center of my lips first with Sephora gel black liner, for the “teeth” I used NYX “milk” jumbo pencil, and for my lip color, I used a lip crayon I got from the beauty supply store (the name rubbed off sorry) but any hot pink, or fuscia lip color would do. I then lined my lips with the same Sephora gel liner to make them stand out. For highlight on the lip I used the same “milk” pencil. Awwwww…… *hugs* Well done Elyse! Very cool!! I love it.